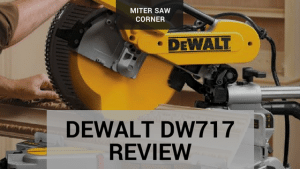 →Dewalt DW717 Review: Is this the 10inch miter saw you are looking for? Dewalt DW717 Review: Is this the 10inch miter saw you are looking for? The DEWALT brand name goes hand in hand with durable and quality products. The DW717 10-Inch Double-Bevel Sliding Compound Miter Saw is no exception. This miter saw is packed with features that are designed for accuracy and a great variety in cutting. 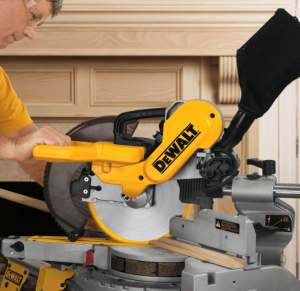 Is the DEWALT Dw717 the right miter saw for you? First of all, this miter saw comes perfectly set to square out of the box. The DW717 miter saw has a sturdy design and includes an adjustable stainless steel bevel detent plate with 11 positive stops. It also boasts a clamping mechanism that has dual steel rails and linear bar bearings. This results in you being able to make very accurate cuts without any difficulty. It is also easy to adjust with the cam-lock miter handle, adding a lot of versatility thanks to the saw’s large miter capacity. The capacity ranges from 0 to 60 degrees to the left and 0 to 52 degrees to the right. Along with this, there is also a convenient detent override. This enables you to change the miter setting without having the saw slip into the miter detents. Another amazing feature is the tall sliding fence. The fences are taller and have better versatility and adjustability than previous models, making it easy to work with base and crown mouldings. When working with really long pieces of wood, a miter saw’s stability is very important. Luckily, the DW717’s work table is 22 inches wide. You can extend this work table to a very convenient supporting surface of 37 inches by opening the two aluminum fences. If you need even more room to make deep bevel cuts, you can also extend the upper portion of the fences by sliding it to the left or right. This double-bevel sliding miter saw allows you to make a truly wide range of cuts. The saw head can bevel from 0 – 48 degrees left and right. The miter saw can also be flipped (rather than having to flip the wood) when bevels are being cut. The sliding function is especially helpful when cutting through wider pieces of wood. Thanks to the back fence design, a 45-degree bevel cut can be made through dimensional lumber up to 2 x 14 inches. What’s more, adjusting the miter saw is very easy. This is because of all the reasonably sized and well-designed adjustment knobs and levers, making them easy to manipulate and grasp. It is clear to see that the manufacturer thought of everything you might need in a 10 inch double bevel miter saw. The box comes with one DW 717 10-inch double-bevel sliding compound miter saw. Included is a 40 tooth blade, dust bag, clamp, and wrench. For added easiness and accuracy, this saw is compatible with the DEWALT DW7187 adjustable laser system. This laser system is sold separately but ensures an easy to see cutting line by projecting a red laser line. Another good buy would be a commercially available miter saw stand. This will make for safer cutting, as well placing much less stress on your back. It is essential when making repeatedly precise cuts. The blade that comes with this 10 inch miter saw is a 40 tooth rough cut non-carbide blade. The blade, as with blades that come with the majority of miter saws, is a general purpose blade that is meant for rough work. It is a fairly good versatile blade. However, when you are taking on a project that needs a finer finish, it’ll be best to invest in a blade that was designed for that sort of work. Luckily, the DW 717’s blade is fairly easy to change once you get the hang of it. The dust bag is small and poorly designed. However, it is no more ineffective than most dust bags that come with any other saw (and still streets ahead of cheaper models like the Hitachi C10FCH2). This can easily be sidestepped by connecting your miter saw to a dust collector or a shop vacuum. Just keep in mind that dust port is relatively small at 1-1/2 inches. You can buy this saw in most places online, including the DEWALT website. However, Amazon offers this product for less than the manufacturer’s suggested retail price. When buying the DEWALT DW 717 miter saw on Amazon comes with free shipping, the standard warranty included and Amazon’s great customer service and returns policy. If you are looking for a useful tool that can be used for a variety of crosscutting and miter-cutting jobs, then this is definitely the right miter saw for you. The DEWALT DW 717 10-Inch Double-Bevel Sliding Compound Miter Saw is accurate, easy to use and does the job quickly and effectively. It may not be the cheapest miter saw around, but it won’t break the bank either. All things considered, though, it will definitely be a worthwhile buy. As with most DEWALT products, the DW717 miter saw is a good quality, durable piece of equipment that will last you a very long time.